After eating at fine dining restaurants for the past couple of days we decided we’d like something a bit more casual for our last day in Copenhagen. We were spoilt for choice as there are countless cafe bars in the city. 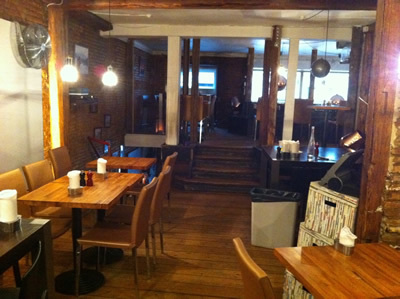 We ended up at ‘Tight’ based on some fantastic reviews and it’s location very near to Christiansborg, home of the Danish monarchy. Within a minute of stepping inside Tight I knew we’d found what we were looking for. It manges to pull off looking & feeling incredibly casual yet cool and trendy at the same time. It’s very modern and ‘urban’ looking inside with bare brick walls and distressed paint work, shabby chic is the technical term I believe! The menu is small and quite a bizarre mix, starters included ‘Mushroom and truffle soup’, ‘Fois Gras’, ‘Australian Bouillabaisse’ as well as the 2 we ordered ‘Mussels “sauce poulette”‘ and ‘Chicken Vol au vent’. My Mussels were great, very large and very fresh. I had no idea what “sauce poulette” was but I now know that it contains white wine, cream , parsley and carrots. I also know that it is very tasty. The bread was great too, as it has been everywhere i’ve eaten in Copenhagen actually. Not quite up there with the soda bread of Noma but really good bread all the same. My partners Vol au vent was also very good and a long way from the image I had in my head before it arrived. I think the last time I had a Vol au cent was around 1998 at a family christening and it wasn’t good. Tight have managed to restore my opinion though as this one was great, really soft juicy chicken with perfectly cooked pastry and in a rich and creamy mushroom sauce. Main courses were also an interesting mix wish dishes including ‘Pumpkin Risotto’, ‘Lamb Shank’, ‘Pork Schnitzel’, ‘Duck Confit’ & ‘Surf ‘n’ Turk’. I was very tempted by several of them but whilst we were deciding we noticed another table being served with ‘Tight Burgers’ and they looked amazing so much so that we ordered 2 immediately. They arrived looking just as impressive up close as they had from a distance. Huge beef patties served between slices of foccacia topped with a mound of onions, mushrooms, bacon and Emmental cheese. It really was one of the best if not the best burger i’ve ever eaten, the beef was seriously juicy, cooked medium rare as all good burgers should be and the accompaniments worked perfectly. The only problem was fitting it into my mouth. My partner ended up eating much of it with a knife and fork but I struggled in a typical male fashion. 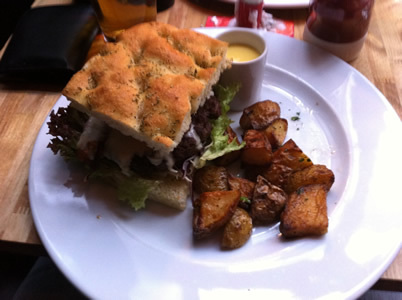 The amazing burgers were served with garlic roast potatoes and home made aioli which were very nice too. Despite being very full after finishing the monster burgers I was determined to try something from the dessert menu. Again it was a multi-national selection including ‘Profiteroles’, ‘Pineapple Capriccio’ and ‘Aussie Creme Brûlée’. I’ve no idea what the Aussies have done to a Creme Brûlée so I had to order one and find out. It arrived looking very much like a traditional Creme Brûlée which isn’t a bad thing as they’re quite probably my all time favourite dessert. I was wondering what was ‘Aussie’ about it though. The answer was to be found inside as amongst the vanilla seeds were some other curious little seeds later identified as ‘wattleseeds’ which were a traditional food of Australian Aborigines. There was so much vanilla it was difficult to identify exactly what the wattleseeds tasted like but as a combination they worked fantastically well together and the Brûlée was delicious. All 3 courses were exceptional, the service was very good too. The owner served us personally and was very friendly and chatty. He is an Australian which explains a few of the dishes on the menu. Tight was the perfect end to a brilliant trip. Copenhagen is an amazing city in many ways, not least the quality of the food. It’s not just the top end like Noma that is delivering great food but the cafe bars like Tight too.